(Phys.org)—Physicists have built one of the first basic elements of a trapped Rydberg ion quantum computer: a single-qubit Rydberg gate. The achievement illustrates the feasibility of building this new type of quantum computer, which has the potential to overcome the scalability problems facing current approaches to quantum computing. 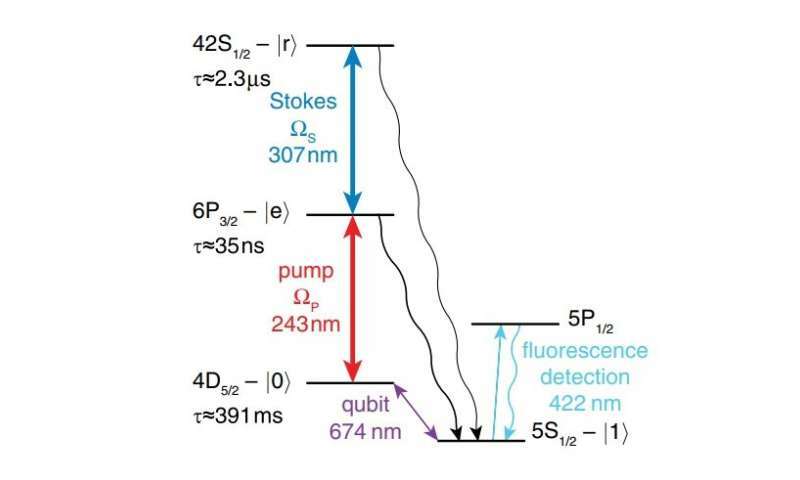 The physicists, Gerard Higgins, Markus Hennrich, and their coauthors at Stockholm University and the University of Innsbruck, have published a paper on their results with single trapped Rydberg ions in a recent issue of Physical Review Letters. Currently, one of the biggest challenges facing quantum computers is scaling up the number of entangled qubits used in each logic gate, which is essential for practical quantum computing. Scaling is so difficult in part because the multiqubit gates commonly used in trapped ion systems suffer from the problem of "spectral crowding" as the number of qubits increases. However, trapped Rydberg ion systems are immune to spectral crowding, which raises the possibility that quantum computers made from trapped Rydberg ion qubits may offer a new route to realizing scalable quantum computers. In the current study, the researchers built the first single-qubit Rydberg gate, and they expect that it should be possible to extend the single-qubit version to a two-qubit Rydberg gate, and to continue to add more qubits in the future. In order to build the single-qubit Rydberg gate, the physicists needed to demonstrate, for the first time, the coherent Rydberg excitation of an ion. This was a two-step process in which they started with a strontium ion confined in a trap. Using lasers, they excited the ion from a low-lying qubit state to a first excited state, and in turn excited this state to an even higher-energy Rydberg state. Rydberg states are considered exotic states of matter, as one of the ion's valence (outermost) electrons is excited to such a high-energy orbital and located so far from the nucleus that it is barely bound to the ion. The key achievement here is that this Rydberg state was achieved in a coherent fashion, which is necessary for building multiqubit Rydberg gates. By combining the coherent Rydberg excitation with methods of qubit manipulation, the researchers could then demonstrate the single-qubit Rydberg gate. "This work shows that Rydberg ions can be coherently controlled, and so many of the interesting phenomena that are explored with neutral Rydberg atoms may also be explored in this system, perhaps with additional advantages owing to the exceptional control that researchers have over trapping ion systems compared with trapped atom systems," Higgins told Phys.org. In addition to their potential scalability advantages, future trapped Rydberg ion quantum computers may also have advantages such as good qubit control and fast gate operation. The researchers plan to further investigate these possibilities in the future. "Next we want to measure strong interactions between two Rydberg ions, and use this to entangle ions together," Higgins said. "Trapped Rydberg ions have the potential to be used to generate very large entangled states."